Supporting automation is challenging and can be very complex. Our engineers are working with many generations of hardware and software and applications. They need to be confident in their ability to solve problems they’ve never encountered. Jason Markesino | Applied Manufacturing Technologies, Inc.
Tell us a little bit about the company Applied Manufacturing Technologies. AMT was founded in 1989 as an engineering services company and has grown over the last three decades to become a full-scale automation solution provider. Our capabilities offer the ability to engage with our customers at every point in their automation journey from front-end consulting, through concept and design, build, and field start-up. Although we are experts in robotic automation, our engineers are experienced in many technologies allowing us to find solutions to best fit the needs of our customers. You have a program called Automation Academy, give us some details on that. As robotic automation began to really take off in the late 90’s we recognized that the demand for expertise to support it far exceeded the pool of talented resources available. At that time programming robots required understanding of programming languages unique to each brand of robots. To bridge this skills gap we developed our own curriculum to train engineers to meet the needs of industry. Training was available for new hires and as engineers returned from field assignments. Learning was done through self-study or under the tutelage of an experienced engineer. This training helped to bring people up to speed much quicker than trying to learn on the job and provided much better service to our customers. 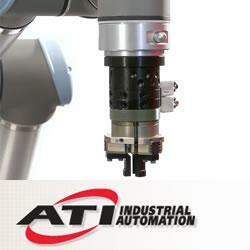 In 2012 we formalized our program as the AMT Automation Academy and invested in a full-time Technical Trainer. The Trainer was tasked with expanding the existing curriculum and developing measures to track student’s progress. Basic robot programming modules were broadened to include several robot models and applications. Also introduced were courses on safety and the very important soft skills of communication and teamwork. The program has grown to include PLC programming and simulation. Today we have a 6,000 square foot automation lab dedicated to the Academy. 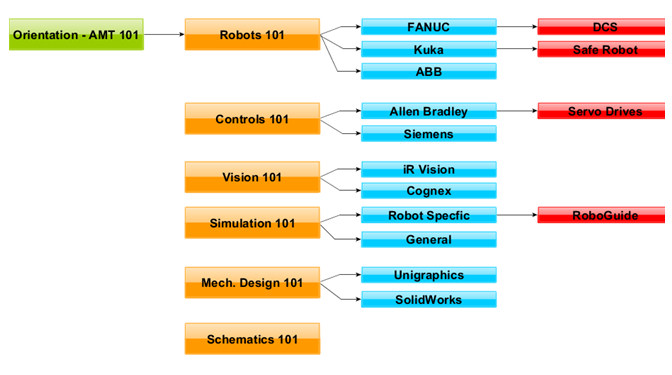 The initial Academy covers FANUC robot programming from the ground up and Allen Bradley PLC’s. After completing the basic Academy additional modules are available for Siemens PLC programming and ABB, Staubli, Kuka, and UR robots. We use Roboguide simulation during the FANUC portion of the class. 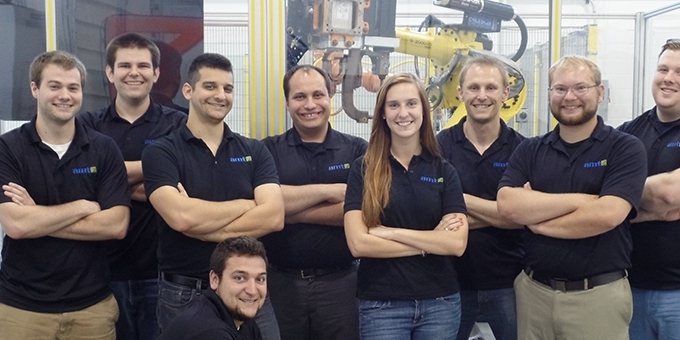 Lab activities are completed in the real world and with Roboguide. We also cover iRVision and DCS. There are pre and post tests for each module and a final post test at the end. Students need to get an 80% or better to pass. There is also a capstone project at the end where students use a FANUC robot and Allen Bradley PLC to create a workcell that does an application. The management team then evaluates the application as part of the final certification. Why is it so important to ensure AMT employees are well trained? Supporting automation is challenging and can be very complex. Our engineers are working with many generations of hardware and software and applications. They need to be confident in their ability to solve problems they’ve never encountered. They build their confidence and competence through rigorous training and exercises in the Academy. They also learn that they have a support network they can call on when they need assistance. You also offer customized external training for your customers, tell us about those services and perhaps share an example. We will take backups of the robot programs and PLC logic from the customer and develop a customized training course on their equipment. We start by covering the fundamentals to give the trainees a baseline and then cover the specifics for their system and applications. The customized training helps increase familiarity with their system including what types of faults may occur and how to recover. We have also developed courses that customers can now conduct themselves. We developed the curriculum and did a train the trainer session, and now the customer has their own internal training program. Jason Markesino is the Engineering Group Leader of the Industrial Automation Group at Applied Manufacturing Technologies. He holds a BS in Mechanical Engineering from Michigan Tech with a concentration in robotic systems. During the past 15 years, he has worked as a robot programmer, controls engineer, and technical trainer. Jason has been instrumental in starting and growing careers of engineers through the AMT Automation Academy. Jason serves as an advisor to multiple universities and is also a mentor on FIRST Robotics Team 27 - Team RUSH.